As my first Christmas married to a Basque man, I have a new found interest in the Basque Christmas traditions. 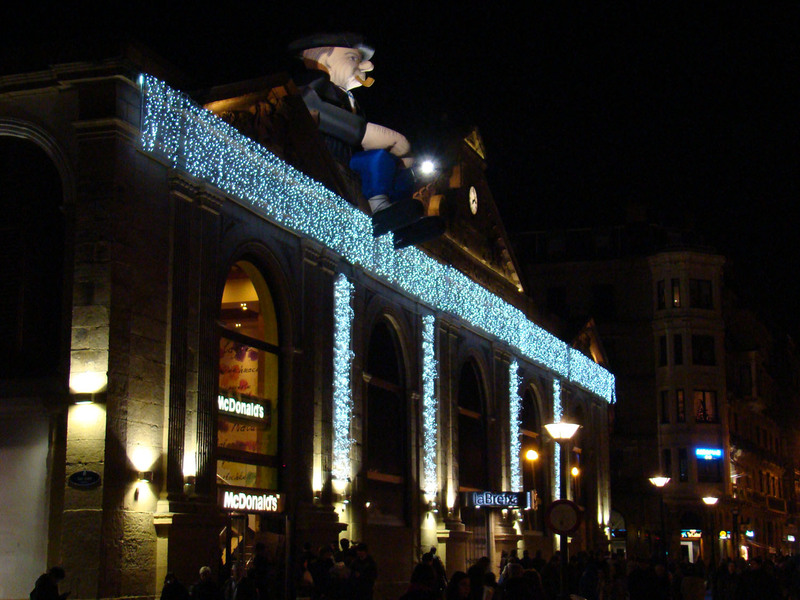 As you might remember from my blogs during previous holiday seasons, the Basques don't really celebrate Christmas with Santa Claus per se, but instead thier own version of him, a coalman named Olentzero. I knew that Olentzero came down from his home on the mountain at the end of the year to bring kids presents and such, but really had no idea where this whole idea came from and decided to do a little research. This idea of a jolly, old man can vary greatly from village to village. Joseba, for example, grew up thinking of Olentzero as a harsh country man who came down from the mountain only bearing one gift - coal - for the bad kids. With a coal-stained face and normally a drink in his hand a pipe in his mouth, this is also a very accepted image of him. Below, you will find the tale of Olentzero and how he came to be a Santa Claus like figure here. It's originally written in Basque (of course) and I found this translated version on euskosare.org, so if some of the wording seems off, I pre-apologize. Enjoy! A long time ago, in the deep forests of the Basque Country, lived a very beautiful fairy. Her hair was golden like the sky and her eyes shone of all fires. Like all the fairies, she took care of people and was always accompanied by amusing small creatures, Prakagorris who helped her in her work. One day when she was walking across the mountains, she stopped near a fountain to brush her hair. Suddenly, the Prakagorris noticed that something moved inside the bushes. The fairy continued to brush her curly hair and did not notice the movement in the bushes until the cries of Prakagorris..
"It is a baby " said the older goblin. "I do not know" said the fairy "it is difficult to understand why men are so cruel sometimes." "From now on” said the fairy to the baby "you will be called Olentzero, because it is wonderful to have found you. And I also give you the gifts of Strength, Courage and Love as a long time as you will live." The fairy then took the baby and brought it towards an old house on the border of the forest where lived a couple without children. "They will be very, very happy to receive this child and will take good care of him" says the fairy and she left the little boy in front of their door. Very early the next morning, when the sun just starts to rise, the man came out of the house to go to milk the cows. He was very surprised to see the baby and called his wife: Darling, quickly come to see what I found ". Olentzero worked hard every day, from sunrise to sundown to help his aging father. After many happy years, Olentzero’s parents passed on, leaving him alone. The years passed, his face wrinkled and his hair turned white. Living in solitude made him sad and he realized that he needed to help people in need. He remembered a house in the village where orphans lived on what the passers by gave them. He realized that these children, just like he, were very alone and that he could make them happy. Olentzero was very intelligent and very gifted with his hands. So he made toys out of wood that he would give to the children when he went to town to sell his harvest. When he had finished these toys, he put them in a large bag, loaded up his donkey and left for the village. He felt very happy that day and his eyes shone of joy. He traveled an entire morning across the mountains to reach the village. The little children at the village were very happy with the toys he offered to them and Olentzero spent the entire afternoon playing with them and telling them the stories that his father told him when he was young. The orphans adored Olentzero and after this marvellous day, they did not feel so alone anymore. Since then, Olentzero was very well known in the village. As soon as he arrived, it was surrounded by the children. This lasted for many a beautiful years but one day, a terrible storm hit the village and the mountains, causing a lot of damage. The strong and cold winds and the thunder frightened and upset the inhabitants, and in particular the children. One day, when Olentzero returned to the village, he saw lightning striking a house. He ran quickly towards the house and saw terrified children by a window. Without hesitating, he entered the house in flames, protected the children from fire with a blanket and made them leave the blazing inferno, by a window on the second floor. But as he tried to leave, a huge old beam fell from the ceiling and landed on top of him. Olentzero fell with pain and his beautiful and strong heart stopped. People cried when they saw the house in flames and what had happened. They realized that they could do anything more. It was then when suddenly a bright light appeared to them coming from the inferno. Nobody could see what was happening but inside, the fairy who had found Olentzero as a baby, appeared close to him and started to call his name with her soft voice: "Olentzero! Olentzero!". She said: "Olentzero, you were a good man, loyal and loving. You dedicated your life to the service of others, and you even gave your life to save your neighbor. I do not want that you die. I want that you live forever. From now on, you will make toys and other gifts for the orphans of this village and all the Basque Country." "And we will help you" shouted the Prakagorris, fluttering around Olentzero. And thus in the middle of each winter, at the end of the year, Olentzero would visit each city of the Basque Country bringing gifts and toys to the children without any family. All the children celebrated the arrival of Olentzero by singing him songs and by spreading his message of love, strength and courage.